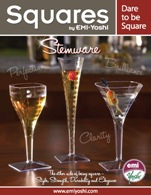 For your wedding or special occasion, try Yoshi plastic square stemware. Available in plastic champagne flutes, plastic wine glasses and plastic martini glasses, this fresh series of plastic stemware dazzles from its high gloss finish to the distinctive square construction. Use these plastic glasses at your next party if you're through with the ordinary and are ready for something different. One of a kind Square Stemware Collection brings sophistication to any event with all the glory of glass, but with the convenience of disposable. Enhance any formal table setting and take it up a notch with these stunning pieces that are sure to get people talking. The heavyweight plastic and high glossed finish, deliver durability without losing the appeal and appearance. Specially designed matte ridges optimize grip and performance and add a touch of sophistication. All glasses are 1 piece. Pair them with one of your many wedding plastic plates and create the perfect setting. We have a large selection of plastic wine glasses, goblets and champagne flutes in this style. You'll love how they look at your event. 8oz. Clear Plastic Square Tall Martini Glasses Maryland Plastic 6pk. 8oz. Clear Plastic Square Tall Martini Glasses 6pk.